In October 1748 the Treaty of Aix-la-Chapelle brought to an end the War of the Austrian Succession. It was a war which England had entered with some reluctance, and from which she gained very little, but she had acquitted herself fairly honourably. In November, bands of workmen began to erect an enormous wooden structure in London’s Green Park, 410 feet long and 114 feet high. It was designed in Palladian style, with a central triumphal arch and colonnades, statues of Greek gods and a bas-relief of the King by one Giovanni Servadoni (actually a Frenchman, Jean-Nicholas Servan), best known for his work in the London theatres. It was to be the basis of an enormous fireworks display. 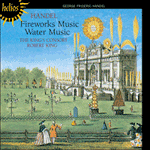 By February 1749, when peace was officially declared, the ‘machine’ was almost completed, and Handel, already well known for his ‘Fire Musick’ from Atalanta (which was a regular accompaniment to firework displays in the pleasure gardens), was commissioned to supply suitable music. In addition, fireworks experts were engaged from Italy. However, for once Handel and royal taste were at odds, and a sequence of ill-tempered letters flew between the Duke of Montague, Master General of the Ordnance (responsible for military music), Charles Frederick, the grandly titled ‘Comptroller of his Majesty’s Fireworks as well as for War as for Triumph’ and Handel. It appeared that the King was originally against any music at all but later, on hearing ‘the quantity and nomber of martial musick there was to be, he was better satisfied, and said he hoped there would be no fidles’. There was a further problem when Handel proposed to lessen the number of trumpets and french horns from sixteen to a mere twelve, and, much worse in the official eye, to have ‘violeens’. On 28 March 1749 the Duke wrote: ‘I dont at all doubt but when the King hears it he will be very much displeased … it ought to consist of no kind of instruments but martial instruments … it behoves Hendel to have as many trumpets and martial instruments as possible, tho he dont retrench the violins, which I think he should … the King has, within this fortnight, expressed himself to this purpose’. The rockets and whatever was thrown up into the air, succeeded mighty well; but the wheels, and all that was to compose the principal part, were pitiful and ill-conducted, with no changes of coloured fires and shapes: the illumination was mean, and lighted so slowly that scarce any body had patience to wait the finishing. In addition, the right-hand pavilion (near to which the orchestra had been performing an hour earlier) caught fire during the display, and, being all wood, burned to the ground. This was obviously too much for the designer, Servadoni, who drew his sword on Charles Frederick for so conspicuously failing in his role of Comptroller of the Fireworks: Servadoni was ‘disarmed and taken into custody, but dischar’d the next day on asking pardon’. The autograph score of the Musick for the Royal Fireworks, now held in The British Library, shows signs of the negotiations between Handel and the authorities. They seem eventually to have settled on nine trumpets, nine horns, twenty-four oboes, twelve bassoons (including a contrabassoon), and three pairs of kettledrums. There are indications too for an unspecified number of side-drums. We also know that a pair of ‘double drums’, a particularly large and unique pair of timpani held (and sadly later destroyed in a fire) at the Tower of London, were hired for the occasion. Deleted from Handel’s very specific instructions in the score (even down to how many players should be distributed on each part) is a serpent, and also crossed out in some of the later movements are the indications for string doubling. Although there has been some argument that strings may have taken part in this first performance, it seems unlikely that Handel would in the end have gone directly against royal wishes: rather, it seems, he would have left those comments that he did not cross out for his publisher, or perhaps for the performance that took place at the Foundling Hospital a month later. In purely practical terms, a string section, competing with such a vast array of wind, brass and percussion, on what turned out to be a rather damp April evening, would have added relatively little to the overall volume of sound when playing out of doors. From the autograph score in The British Library it seems evident that Handel added a second Minuet (in D minor) after the other movements were composed. Most probably this would have formed a ‘trio’ to the major-key Minuet, rather than being performed as a prelude, as it more frequently is nowadays. This idea certainly helps make sense of the major Minuet, and also makes the final grand return, with ‘tutti insieme and the Side Drums’ (and in our performance the double drums as well) all the more exciting and majestic. The unique sound of such a huge Baroque wind band is here recreated on record for the first time. To be able to gather together such vast forces is a considerable tribute to the progress that has been made in ‘period instrument’ playing, for a few years ago such a performance on instruments that the composer would have recognized would have been almost unthinkable. In Handel’s performance it seems likely that, to make up the numbers, a number of ‘squaddies’ would have been drafted in: the vastly augmented forces of The King’s Consort gathered in January 1989 did not require that step! 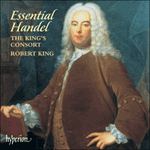 This recording had, for technical and logistical reasons, to take place indoors (in winter), rather than outside (on Handel’s damp April evening), though we used a large recording space that would not be too far removed from an outdoor sound. The results are remarkable. 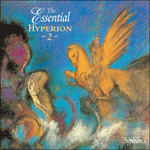 The blend of two dozen oboes and twelve bassoons produces a sonority of considerable richness, and, when added to that of nine horns playing softly, as in ‘La Paix’, produces a ravishing sound quite unlike anything that modern orchestral instruments can produce. And, of course, Handel’s grandest moments with the full band, including all nine trumpets and the two giant double drums, could hardly have produced a more stately way of expressing a nation’s rejoicing. En octobre 1748, le traité d’Aix-la-Chapelle mit fin à la Guerre de Succession d’Autriche, dans laquelle l’Angleterre s’était engagée à contrecœur et dont elle ne tira qu’un très maigre profit, malgré une conduite plutôt honorable. En novembre, de nombreux ouvriers entreprirent l’érection d’une énorme structure en bois—410 pieds de long sur 114 de haut—à Green Park. De style palladien, elle comportait un arc de triomphe central, des colonnades, des statues de dieux grecs et un bas-relief du roi, œuvre d’un certain Giovanni Servadoni (en réalité, le Français Jean-Nicolas Servan), célèbre pour son travail dans les théâtres londoniens. Cette construction allait être la base d’un énorme feu d’artifice. En février 1749, à l’heure de la déclaration de paix officielle, la «machine» était presque achevée et Haendel, déjà connu pour sa «Fire Musick» d’Atalanta (qui accompagnait régulièrement les feux d’artifice tirés dans les jardins d’agrément), se vit commander une musique. Des pyrotechniciens d’Italie furent également engagés. Mais les goûts de Haendel se heurtèrent à ceux du roi, et une série de lettres pleines de mauvaise humeur circulèrent entre le duc de Montague, maître général de l’équipement militaire (responsable de la musique militaire), Charles Frederick—au titre grandiloquent d’«intendant des feux d’artifice de Sa Majesté, de la guerre et du triomphe»—et Haendel. Il s’avéra que le roi était initialement opposé à toute musique, mais qu’en apprenant «la quantité et le nombre de musiques martiales qu’il y aurait, il fut plus satisfait et dit qu’il espérait qu’il n’y aurait pas de violons». Un nouveau problème surgit lorsque Haendel proposa de faire passer le nombre de trompettes et de cors de seize à seulement douze et—chose bien pire au regard officiel—d’ajouter des «violeens». Le 28 mars 1749, le duc écrivit: «Je ne doute absolument pas que le roi sera très mécontent de l’entendre … elle ne devrait comporter aucune autre sorte d’instruments que des instruments martiaux … il appartient à Hendel d’avoir autant de trompettes et d’instruments martiaux que possible, même s’il ne réduit pas les violons, chose qu’il devrait, je pense, faire … le roi s’est exprimé en ce sens, au cours de ces quinze derniers jours». Les fusées et tout ce qui fut lancé dans les airs réussirent fort bien, mais les roues, et tout ce qui devait composer la partie principale, furent lamentables et mal conduits, sans changement de couleurs et de formes: l’illumination fut piètre et brilla si lentement que presque personne n’eut la patience d’attendre la fin. En outre, le pavillon droit (près duquel l’orchestre avait joué une heure auparavant), entièrement en bois, s’enflamma pendant le feu d’artifice et fut réduit en cendres. C’en fut manifestement trop pour Servadoni, le décorateur, qui dégaina son épée et s’en prit à Charles Frederick pour avoir si remarquablement failli à sa mission d’intendant des feux d’artifice. Servadoni fut «désarmé et arrêté, mais relâché le lendemain en demandant pardon». La partition autographe de la Musick for the Royal Fireworks, désormais conservée à la British Library, présente des signes de négociations entre Haendel et les autorités. Tous semblent s’être finalement mis d’accord sur neuf trompettes, neuf cors, vingt-quatre hautbois, douze bassons (dont un contrebasson) et trois paires de timbales. Nous disposons également d’indications quant à un nombre non spécifié de caisses claires et savons qu’une paire de «double drums»—deux timbales uniques et particulièrement grandes, gardées à la Tour de Londres (mais malheureusement détruites dans un incendie ultérieur)—fut jouée pour l’occasion. Un serpent est supprimé des instructions très spécifiques de Haendel sur la partition (qui précise jusqu’au nombre d’instrumentistes par partie); quant aux indications pour le doublement des cordes, elles sont, elles aussi, biffées dans certains des mouvements postérieurs. Même si quelque argument est venu nourrir l’hypothèse selon laquelle les cordes auraient participé à la première, il paraît improbable que Haendel fût, en fin de compte, allé franchement à l’encontre des volontés royales. Il semble plutôt avoir laissé les commentaires non raturés pour son éditeur ou, peut-être, pour l’exécution qui se déroula un mois plus tard, au Foundling Hospital. En termes purement pratiques, un groupe de cordes, rivalisant en extérieur avec un tel éventail de vents, de cuivres et de percussions, lors de ce qui s’avéra une soirée d’avril assez humide, aurait relativement peu ajouté au volume sonore global. La partition autographe de la British Library laisse supposer à l’évidence que Haendel ajouta un second Menuet (en ré mineur) après que les autres mouvements furent composés. Ce qui constitua très probablement un «trio» pour le Menuet en majeur, plutôt qu’un prélude comme on le joue plus souvent de nos jours. Cette idée aide certainement à donner un sens au Menuet en majeur, et rend la grandiose reprise finale, avec «tutti insieme et les caisses claires» (et, dans notre interprétation, avec aussi les «double drums»), tout ce qu’il y a de plus passionnant et majestueux. Le son unique d’un orchestre d’instruments à vents baroque aussi énorme est recréé ici pour la première fois au disque. Pouvoir rassembler des forces aussi vastes témoigne des progrès accomplis dans le jeu sur «instruments d’époque», car une telle interprétation, sur des instruments que le compositeur aurait reconnus, aurait été presque impensable voilà dix ans. L’exécution de la musique de Haendel avait probablement requis l’incorporation d’un certain nombre de «bidasses». Les forces extrêmement augmentées de The King’s Consort, rassemblées en janvier 1989, n’allèrent pas si loin! Pour des raisons techniques et logistiques, cet enregistrement dut se dérouler en intérieur (en hiver) et non en extérieur (lors de l’humide soirée d’avril haendélienne), mais nous avons utilisé un grand espace d’enregistrement, qui ne devrait pas être trop éloigné d’une sonorité en extérieur. Le résultat est remarquable. Le mariage de deux douzaines de hautbois et de douze bassons produit une sonorité d’une richesse extraordinaire; ajouté à celle de neuf cors jouant doucement, comme dans «La Paix», il engendre un son ravissant, tout à fait différent de celui des instruments d’orchestre modernes. Et, bien sûr, les moments haendéliens les plus grandioses, avec l’orchestre complet, y compris les neuf trompettes et les deux «double drums» géants, n’auraient pu exprimer plus majestueusement la joie de la nation. Im Oktober 1748 beendete der Frieden von Aachen den österreichischen Erbfolgekrieg. Es war ein Krieg, in den England nur widerstrebend eingetreten war und aus dem es sehr wenig Nutzen zog, in dem es sich jedoch recht ehrenhaft geschlagen hatte. Im November begannen Arbeitskolonnen, im Londoner Green Park ein riesiges hölzernes Gerüst von hundertdreiundzwanzig Metern Länge und fünfunddreißig Metern Höhe zu errichten. Es war im palladianischen Stil gehalten, mit einem zentralen Triumphbogen und Kolonnaden, Statuen griechischer Götter und einer Basreliefdarstellung des Königs, ausgeführt von Giovanni Servadoni, den man durch seine Arbeit an den Londoner Theatern kannte (er war Franzose und hieß eigentlich Jean-Nicholas Servan). Dieses Gerüst sollte als Basis für ein gewaltiges Feuerwerk dienen. Die Raketen und alles, was in die Luft geschleudert wurde, hatte mächtig viel Erfolg; dagegen waren die Räder und all das, was den Hauptteil ausmachen sollte, jämmerlich und mangelhaft ausgeführt, ohne Veränderung der bunten Feuer und der Formen: Die Illumination war schäbig und entzündete sich so langsam, daß kaum jemand die Geduld aufbrachte, das Ende abzuwarten. Hinzu kam, daß der rechte Pavillon (in dessen Nähe eine Stunde zuvor das Orchester gespielt hatte) während des Feuerwerks in Flammen aufging und, da er ganz aus Holz gebaut war, vollständig niederbrannte. Das war für den Bühnenbildner Servadoni offensichtlich zu viel; er ging mit blankem Degen auf Charles Frederick los, da er in seiner Rolle als Aufseher des Feuerwerks so kläglich versagt hatte. Servadoni wurde „entwaffnet und in Gewahrsam genommen, jedoch tags darauf wieder freigelassen, nachdem er um Gnade gebeten hatte“. 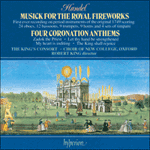 Der autographischen Partitur der Musick for the Royal Fireworks, die heute in der British Library aufbewahrt wird, sind Hinweise auf die Verhandlungen zwischen Händel und der Obrigkeit zu entnehmen. Man scheint sich zuletzt auf neun Trompeten, neun Hörner, vierundzwanzig Oboen, zwölf Fagotte (einschließlich Kontrafagott) und drei Paare Kesselpauken geeinigt zu haben. Außerden finden sich Anzeichen dafür, daß eine unbestimmte Zahl kleiner Trommeln eingesetzt wurde. Des weiteren erfahren wir, daß ein Paar „double drums“, zwei besonders große und einzigartige Pauken aus dem Tower of London (wo sie später leider bei einem Brand vernichtet wurden) für den Anlaß ausgeliehen wurden. Aus Händels sehr genauen Angaben in der Partitur (bis hin zur Verteilung der einzelnen Musiker auf den jeweiligen Part) ist ein Serpent gestrichen, sowie in einigen der späteren Sätze die Anweisung zur Verdopplung durch die Streicher. Auch wenn einige Argumente dafür vorgebracht wurden, daß an der ersten Aufführung Streicher beteiligt waren, ist es unwahrscheinlich, daß Händel letztlich direkt gegen die Wünsche des Hofes gehandelt hat. Vielmehr hat man den Eindruck, als habe er die nicht durchgestrichenen Anweisungen für seinen Verleger zurückgelassen, oder vielleicht für die Aufführung, die einen Monat später im Foundling Hospital stattfand. Ein rein praktischer Aspekt wäre, daß eine Streichergruppe in Konkurrenz zu einem so gewaltigen Aufgebot an Holz- und Blechbläsern sowie Schlaginstrumenten an einem regnerischen Aprilabend beim Spielen im Freien relativ wenig zum Klangvolumen beigetragen hätte. Aus der autographischen Partitur in der British Library ist ersichtlich, daß Händel ein zweites Menuett (in d-Moll) hinzugefügt hat, nachdem die anderen Sätze komponiert waren. Höchstwahrscheinlich diente es als „Trio“ des Menuetts in Dur und wurde nicht, wie es heute oft der Fall ist, als Vorspiel dargeboten. Diese Idee trägt jedenfalls dazu bei, dem Dur-Menuett einen Sinn zu geben, und macht außerdem die abschließende große Wiederkehr samt „tutti insieme und kleinen Trommeln“ (sowie in unserer Aufführung obendrein den „double drums“) um so beeindruckender und majestätischer. Der einzigartige Klang eines so großen barocken Bläserensembles wird hier zum ersten Mal auf Tonträger nachempfunden. Daß es gelungen ist, derart viele Musiker zu versammeln, ist dem Fortschritt zu verdanken, der beim Spielen auf „historisch korrekten“ Instrumenten erzielt wurde: Noch vor zehn Jahren wäre eine solche Darbietung auf Instrumenten, die der Komponist wiedererkannt hätte, nahezu undenkbar gewesen. Aus Anlaß von Händels Aufführung wurde wahrscheinlich, um auf die volle Zahl zu kommen, eine Anzahl von „Fußsoldaten“ rekrutiert. Beim erheblich verstärkten Ensemble des King’s Consort, das im Januar 1989 zusammenfand, war ein solcher Schritt nicht nötig! Die Aufzeichnung mußte (mitten im Winter) aus technischen und logistischen Gründen im geschlossenen Raum anstatt draußen erfolgen (wie bei Händel an einem regnerischen Aprilabend), aber wir haben einen großen Aufnahmeort mit einer Akustik gewählt, die sich von der im Freien nicht allzu sehr unterscheidet. Das Ergebnis ist bemerkenswert. Die Mischung aus zwei Dutzend Oboen und zwölf Fagotten erzeugt eine Sonorität von beachtlicher Üppigkeit und schafft, wenn sie wie in „La Paix“ mit der von neun leisen Hörnern verbunden wird, einen hinreißenden Klang ohne jede Ähnlichkeit mit dem, was moderne Orchesterinstrumente hervorzubringen vermögen. Und natürlich sind Händels prunkvollste Momente—unter Einsatz des gesamten Orchesters einschließlich aller neun Trompeten und der beiden gigantischen „double drums“—eine unvergleichlich feierliche Art und Weise, die Freude einer Nation zum Ausdruck zu bringen.